I've got a couple little bits of info to share with you today. Chris and I have been very busy working on formating all of our patterns into easy to download pdf's. Now when you click on a pattern on my sidebar you will be able to download straight from the blog, or if you visit my Ravelry patterns page you can add the pdf's to your Ravelry library. It's so much easier than trying to print a pattern off of a blog, it's neat and tidy and makes the journey from finding the pattern to actually knitting the pattern that much easier. Speaking of Ravelry, a while ago a lovely knitter set up a Tanis Fiber Arts Appreciation Society group on Ravelry and I am just tickled that so many people have already joined! It seems to have become the perfect place for knitters to talk about the inaugural shipment of the TFA Year in Colour Club. Gotta love Ravelry, it makes me feel like I have so many knitting friends! And there has been knitting, I'm working on my first pair of toe up socks. I am using this pattern from Wendy Knits. I have become so comfortable with my basic top down sock that it never occurred to me to try anything else. But I've got two 60g skeins of Prism Merino Mia in the very pretty Harvest colourway and I want to make a pair of socks, each sock using exactly one skein. Toe up seemed like the way to go, I'll knit until I run out of yarn and then start the next. 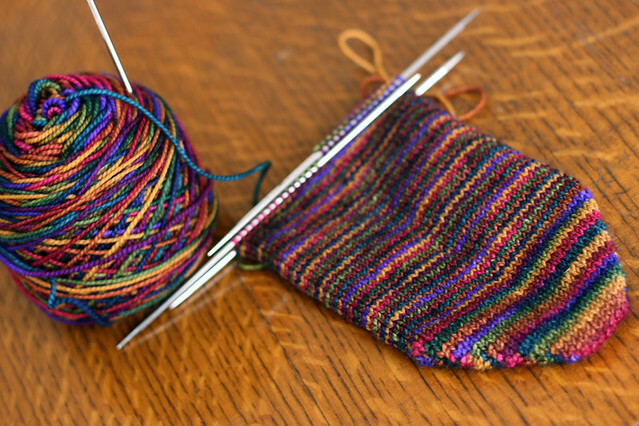 I am not typically a huge fan of short row heels, I just don't find that they fit as well as a slip stitch heel, but when I'm working with really variegated yarns I like the fact that a short row heel doesn't change the striping like the added stitches in a gusset do. A couple years ago I knit these socks with a short row heel specifically for that reason and I really like the way it worked out. I'm hoping to have the same pretty result with this current pair. 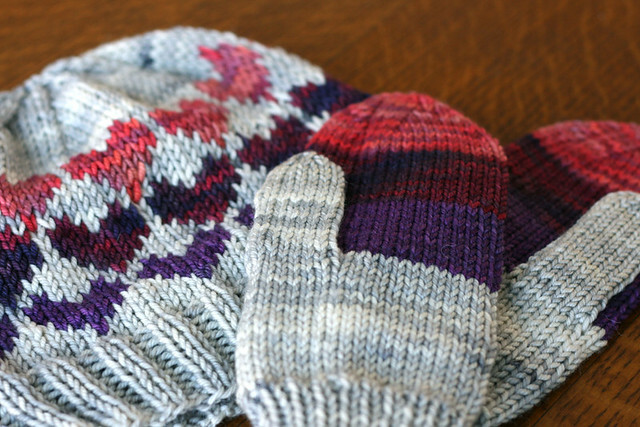 I've also been doing some hat and mitten knitting, but more on that another day.